Baby Milk Action is relieved that product placement of junk foods, infant formula and follow-on formula will not be permitted on UK made TV programmes, but is disappointed that baby feeding equipment, such as bottles and teats and other products could be allowed. infant formula and follow-on formula. Baby Milk Action is the UK member of the global network, the International Baby Food Action Network (IBFAN) and the secretariat of the UK Baby Feeding Law Group a coalition of 23 leading health professional and mother-support organisations (2). These and many other groups have been calling for the UK - which has one of the lowest breastfeeding rates in Europe - to stand firm in its defence of public health and to strengthen, not weaken legislation covering the marketing of baby feeding products in line with the recommendations of the World Health Assembly (3). In its response to the Department of Culture Media and Sport (DCMS) consultation Patti Rundall, OBE, Policy Director of Baby Milk Action, highlighted the fact that breastfeeding is the natural and optimum way to feed babies and provides an ideal window of opportunity for obesity prevention. "We are very pleased that the Government seems to have listened to our concerns. 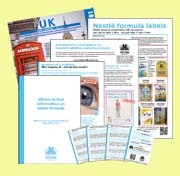 Allowing product placement of and infant feeding products would exacerbate the serious problems the UK Government already has in trying to ensure that parents receive consistent, unbiased and objective information. UK/EU legislation is already full of loopholes, and allows a high level of misleading advertising of baby milks and foods - many of which are high in sugars or sweeteners and which affect children's taste palates and appetite control. Many are cleverly promoted as the healthy option with deceptive health and nutrition claims. Allowing companies to pay to have any feeding product integrated into story lines makes an already bad situation much much worse so It is a shame feeding equipment is not covered." “As a result of the constant commercial bombardment, children are now more brand conscious than ever. Toddlers as young as two have been found to have attachments to brands. Children as young as three are capable of recognizing trademarked brand logos. One study found that 81% of three- to six-year-olds after having seen just the logo for Coca-Cola can describe the soft-drink product. On average, teens between thirteen and seventeen have 145 conversations about brands per week, more than twice as many as adults." The baby feeding industry shows no signs of abiding by its obligations under World Health Assembly Resolutions, or halting its drive to maintain and expand its markets in the face of government efforts to protect breastfeeding and infant health. (5) According to the analysis of the global baby food market, Euromonitor International, "Baby food global retail value sales will surpass US$31 billion in 2008, a current value increase of 10.5% from the previous year at fixed US$ exchange rates. respectively. Western Europe and North America remain the third- and fourth-largest regional markets. 2. IBFAN is a network of over 200 not-for-profit citizens groups working to protect infant and young child health in over 100 countries. Infant formula components alter cholesterol synthesis and degradation machinery and initiate oxidative stress due to triacyglycerol esterification positional differences.